Hiro Miyoshi Hair and Beauty is a luxurious haven in the heart of the Mayfair. Our mission is to provide the highest standard or customer service to match the best quality of hairdressing there is. We put the client at the centre of everything we do. Every detail and decision revolves around what we believe improves the experience of our clients. And we know that the only way to achieve the desired results are by attracting and inspiring the best personnel. We are proud and appreciative to our staff - the best people to share this journey with. 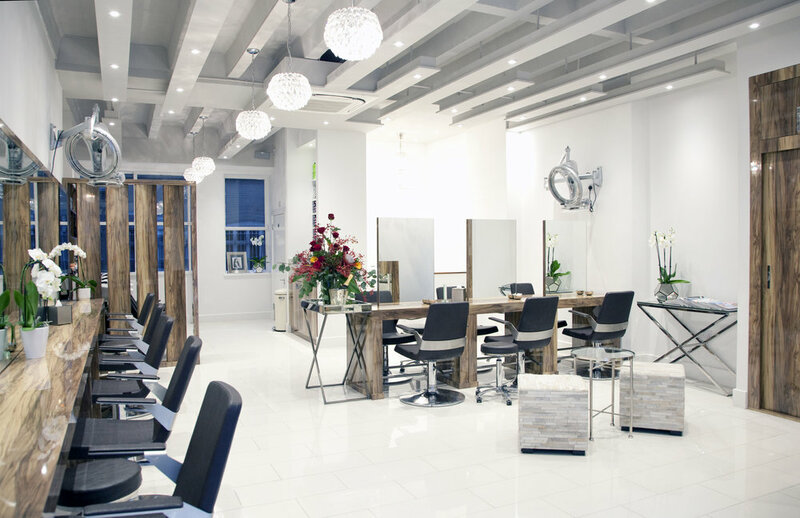 As soon as you enter the salon, you will feel an instant calm forgetting the hustle and bustle of busy London life. The minimalistic interior design and natural colour palette sets the tone of the salon ambience and the calmness of Hiro's Japanese culture. At Hiro Miyoshi Hair & Beauty, you can completely unwind in the skilled hands of our team and enjoy a relaxing treatment that will leave you not just looking, but feeling your best. You don't need to go to Japan to experience Omotenashi - you only need to book your next hair appointment here, with us. Sophie Chevalier is an award winning stylist with over 25 years’ experience. She is best known for her session styling work on photo-shoots with celebrity clients. Her experience styling for photo-shoots, fashion shows and red carpet events makes her much in demand with her salon clients. She brings to Hiro Miyoshi a passion for creativity and a flair for creating striking looks. With ten years of experience in Japan and almost a decade more in London, Yoko is a Senior Director within the Hiro Miyoshi Team. With expertise ranging from Cutting, Colouring and Perming, she is also our Yuko specialist. Yoko has a keen eye for detail and always goes above and beyond to make every clients experience in the salon one they will never forget. Having been a part of the Hiro Miyoshi reception team for three years Sadie is now moving on to become our salon’s assistant manager. Understanding the journey the client takes from the moment they step foot in the salon to the moment they leave she is determined to make sure every client has a memorable experience for all the right reasons. Marta brings charisma and a positive attitude to our Ritz salon, starting out in France and now in London she is the go to girl for glamour hair. With her strong rapport with the clients and a friendly nature she is amazing at making sure that when you leave our salon it will be a visit you will never forget. Over the last few years Natalia has grown within the salon from our Nail Technician moving onto our reception team. She has built a strong rapport with our clients and understands that the client’s needs come first. She is always happy to help and is ready to greet our clients with a welcoming smile. Our Assistant Riccardo brings his hardworking and dedication to the Hiro Miyoshi Team. Currently being trained and educated by Hiro Miyoshi he is working towards becoming a stylist within the salon in the future. With his relaxing and calm manner he is amazing with helping the clients to unwind at the backwash. Specialising as a nail technician, Elena has a soft touch with our clients. With experience from Moldova and a passion for all things nails she offers services in Manicure, Pedicures, Gel and Shellac. With her precision and gentle manner she makes sure our clients are always looked after and relaxed when having their nails done. With years of experience in the hair and beauty industry, Carlos knows how important it is to make every client feel like the best version of themselves. Making sure to pay attention to the details, no matter how big or small, his attentiveness, focus and passion shines through in every aspect of his work. Bence, originally from Hungary moved to London with the purpose of furthering his career in hairdressing, with a strong dedication and passion for learning he is a great addition to the team. Making the client feel at home and paying close attention to their needs he has built a strong rapport with our clientele. Kalum brings a warm and positive manner to our salon, proving to be a big hit with our clients thanks to his friendly approach, confidence and knowledge of all things hair he is always on hand to give the clients the best possible service and make sure they leave with a smile on their face. Originally from the Czech Republic, Miroslava is currently training alongside Hiro. With her natural warmth and politeness she makes the clients feel at ease and always in safe hands. Working towards becoming a stylist in the salon she has shown dedication, eagerness and a positive outlook to everything towards hair industry.